CABLE HIGHLIGHTS: A fiery GAME OF THRONES towered over the rest of Sunday cable for HBO, remarkably up 0.22 to 3.92. (And considering how this week’s episode ended, another bump next week wouldn’t be a surprise.) The rest of the line-up had SILICON VALLEY up 0.09 to 1.00, VEEP up 0.02 to 0.46, and LAST WEEK TONIGHT down 0.02 to 0.58. AMC’s FEAR THE WALKING DEAD slipped 0.03 to 1.94, and TALKING DEAD lost 0.04 to 0.65. Showtime remained low, as HOUSE OF LIES ticked up to 0.14, the season (and likely series) finale of DICE managed a 0.03 rise to 0.07, and PENNY DREADFUL lost a tick to 0.19. Starz’s THE GIRLFRIEND EXPERIENCE ticked up to 0.06/222K. On Adult Swim, ROBOT CHICKEN shed a tick to 0.68, MIKE TYSON MYSTERIES held at 0.60, and MR PICKLES was also steady at 0.49. 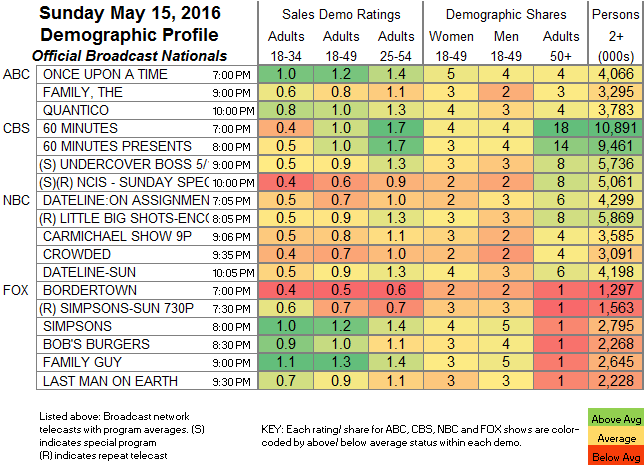 Hallmark’s GOOD WITCH lost a hundredth to 0.23. USA’s MOTIVE fell 0.04 to 0.27. The unscripted side (which to an extent benefited from comparisons to Mother’s Day last Sunday) was led by E!’s KEEPING UP WITH THE KARDASHIANS, up 0.09 to 0.84, with lead-out RICH KIDS OF BEVERLY HILLS up 0.06 to 0.33. Fox Sports 1’s NASCAR race was at 0.78. Discovery’s NAKED & AFRAID, at 0.77, was up 0.22 from last week’s special, but down 0.07 from the regular episode 2 weeks ago. NBC Sports Net’s NHL PLAYOFFS game was at 0.62. Food Network’s FOOD NETWORK STAR gained 0.12 to 0.48, and SPRING BAKING CHAMPIONSHIP jumped 0.13 to 0.46, with CUTTHROAT KITCHEN up 0.07 to 0.34. On Bravo, SHAHS OF SUNSET was up 0.05 to 0.46, and THICKER THAN WATER rose 0.06 to 0.26. 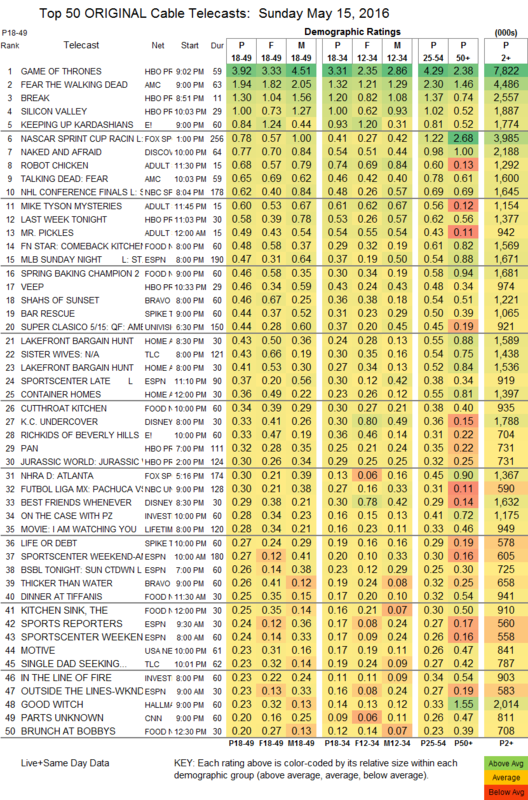 On Spike, BAR RESCUE had a big 0.18 increase to 0.44, and LIFE OR DEBT gained 0.12 to 0.27. TLC’s SISTER WIVES slipped 0.06 to 0.43, and SINGLE DAD SEEKING fell 0.03 to 0.23.